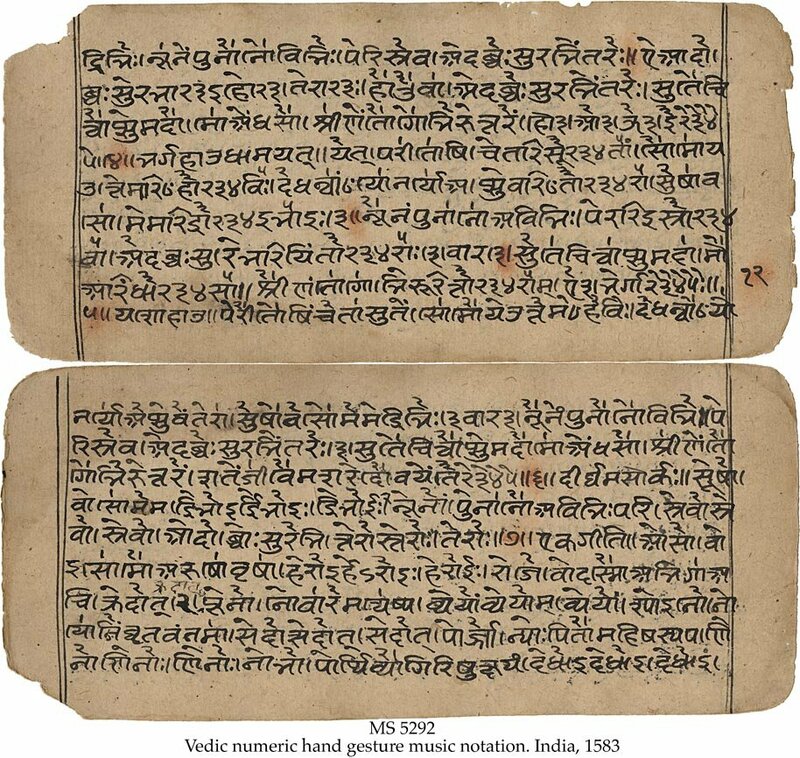 Description	 MS iin Sanskrit on paper, India, 1583, 81 ff. (complete), 11x24 cm, single column, (9x20 cm), 7-9 lines in archaic Devanagari book script, 7-9 lines in Vedic numeric hand gesture music notation. Binding	 India, 1583, pothi paper covers with framed title. Provenance	 1. Sam Fogg, cat. 17(1996):55. The Uhagana is a work in 7 parvans (chapters) containing details of the chants used in sattras (the 10 central days of a long soma sacrifice), in the year long sacrifice, in one day rites, in rites of 2 to 10 days, in expiations prayascittas and rites for special wishes. It is one of the 4 ganas (song-books) of the liturgical Kauthuma Samhita of the Samaveda, providing details of the particular melodies to be employed in the rendition of the samans. Both the Gramageyagana (detailing songs which can be practised in the village) and the Aranyagana (containing esoteric songs meant for study in the forest), belong to the Purvarcika, the first book of the Samaveda. The 2 other ganas, the Uhagana and the Uhyagana are associated with the Uttararcika and were essential for chanters performing Soma sacrifices. In their ritual practice the Uhagana and the Uhyagana follow the Puspasutra. 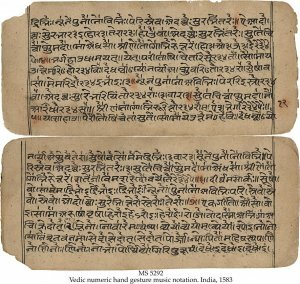 The music notation goes back to the ancient Vedic period. The numbers above the text lines correspond to specific hand gestures from which the correct tone of the chant could be interpreted.